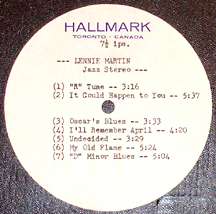 The Hallmark Sessions, recorded at Hallmark Studios in Toronto, Canada on November 28, 1961, were recorded when jazz guitarist Lenny Breau was only twenty years old. This is Lenny's first professionally recorded jazz session and, until now, has never been released. 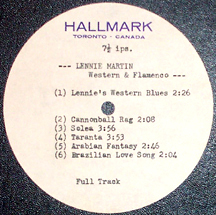 The original analog reel-to-reel master tapes have been in the possession of Lenny's former manager, George B. Sukornyk, for over forty years. In addition to several Jazz standards such as "It Could Happen To You" and "I'll Remember April," Lenny also performs several solo Flamenco and Country & Western pieces, as well as four previously unheard original compositions. 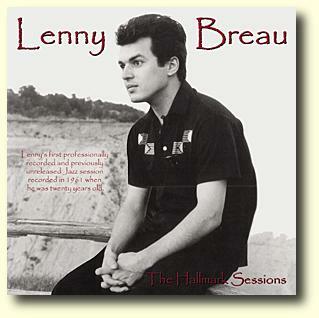 Lenny recorded seven tracks with acoustic bassist Rick Danko and drummer Levon Helm, of The Band, as well as six solo guitar pieces at Hallmark Studios. Ricky, who was 18 years old, and Levon, who was 21 at the time of the recording, both played in Ronnie Hawkins' backing group the Hawks in 1961. See the liner notes below for more details about the session. In addition to the trio and solo tracks, there are also six bonus tracks that contain the stereo versions of the trio pieces. All tracks have been professionally mastered using 24-bit digital technology.